My name is Luke Jones, and I work in Newport, South Wales, which is twinned with Kutaisi in Georgia. When I was asked to write about my recent visit to Georgia, I jumped at the opportunity to share my experience of this beautiful nation in the South Caucasus. I visited Georgia in summer 2016 as part of a tour of the three Caucasian nations of Georgia, Armenia and Azerbaijan. 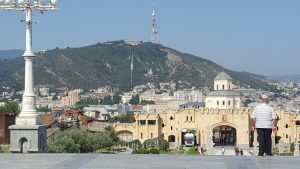 I feel obliged as a British tourist to comment on the Georgian weather in August before going any further, and it will not surprise anyone from Newport to learn that my partner and I found Tbilisi in mid-August to be swelteringly hot. This in itself did not stop us seeing the best of this ancient, vivid, patchwork city, but it did leave us frustrated at just how easily the locals coped with it as we downed bottles of water compulsively (incidentally, the tap water in Tbilisi is perfectly safe to drink). The first impression we had of Tbilisi and Georgia was of a confident and outward looking nation, one that is reaching out for links across the world, while still remaining true to its proud established traditions like the Georgian Orthodox Church. Arriving at Europe Square, we first caught a glimpse of the picturesque skyline of Tbilisi, which encapsulates this spirit of marrying old and new in one panorama, featuring the cable car to the citadel at Narikala Fortress; the Peace Bridge; and the Presidential Palace, facing the statue of Vakhtang I Gorgasali, 5th century founder of Tbilisi; and the uniquely Georgian tetra conch spires of the Sioni and Sameba Cathedrals. 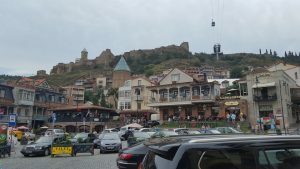 Tbilisi is burgeoning in confidence and is increasingly receptive to tourists from around the world – we heard a far wider range of languages spoken in streets like Afkhazi Street than anywhere else in the Caucasus. This increase in visitors carries with it the inevitable benefits and drawbacks; however I am confident that Tbilisi will not lose any of its charm in the future as more and more tourists, for example from Western Europe and North America, choose to visit. If there is one thing that does capture the essence of Tbilisi – and Georgia more widely – it is spirituality. Georgia is proud of being one of the first Christian nations in the world, and is equally proud of its beautiful and ancient alphabet, something students of grammar will be excited to learn has no genders and no capital letters. The plethora of individual yet interwoven churches in the city reminds the visitor of a time of relics, ritual and reverence. The Sioni Cathedral is a highlight, rebuilt by King David the Builder and legendary home of the cross of St Nino. This church is particularly beautiful at night, lit up like most of the city in a warm and confident yellow ochre. In Tbilisi, we also managed to visit a living mosque and peaceful synagogue, and were welcomed wherever we visited. Initially when we decided to visit Georgia in 3 days, Gori was always going to be on the list of places to see. As a former student of modern history, I felt an urge to visit the birthplace of Joseph Stalin. However, after speaking to a Georgian online, the ancient city of Mtskheta was recommended to us instead, and I am glad that we did this as part of our whistle-stop 3 days. Mtskheta has it all – stunning views, tourist trading and haggling, and more spirituality. Particularly awe-inspiring were the views of two valleys, carved by wide rivers, winding towards us and meeting at the foot of the mountain topped by the Jvari Monastery, the 6th century church built around the wooden cross of St Nino, a World Heritage Site and place of pilgrimage in Georgia. Not only do rivers meet at Mtskheta, however; we also witnessed the meeting of countless families here, as wedding parties appeared to queue up to receive blessings or nuptials at the holy site. Never have I seen so many wedding dresses in one place on one day – Cardiff on a Saturday night, haven for hen parties, is as nothing by comparison. It was also here that we found that as well as spirituality and respect for custom and tradition, Georgians are not squeamish about heights, straddling walls that teeter over a rocky precipice, and taking photos of the views beyond, with zero qualms. We also learned that the frequent honking of car horns in the Caucasus are not done in anger – it is tradition to make as much noise and fanfare with beeping when a wedding party passes as possible. 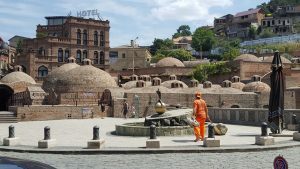 If you’re visiting Tbilisi and Mtskheta over just a few days, or in a season where it’s just too hot to contemplate a marshrutka (minibus), then I would recommend taking in a hop-on hop-off tour which covers all of the above in one day. This comes with a free bottle of water – something I welcomed and polished off within seconds – and an interesting commentary in English, with enough time to get off the (air-conditioned) bus and explore sights on your own. As well as spirituality, history plays a big role in any visit to Georgia. I would recommend the National Museum of Georgia for a walk-through of Georgian history with a particular focus on the ancient, but also a moving and intense exhibition about recent history. The former Parliament building and Opera House lie on a street with a fascinating variety of architectural styles and eras represented in stone (the Parliament of Georgia now sits in Kutaisi). 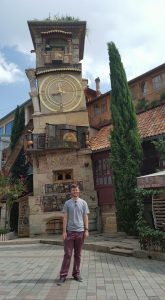 Chiming with full performance at 12noon and 7pm daily, the clock at the Gabriadze puppet theatre in the Old Town is a not-so historical gem that is nevertheless charming and cute, and definitely worth seeing. It looks like something straight out of Harry Potter, and it made me smile. As young people visiting Georgia, we were pleased after a long day of sight-seeing to wander down some streets in the very centre of the capital, which were buzzing with a lively atmosphere, which seems to have carefully cultivated a sophisticated feel with a cosmopolitan array of bars and restaurants, with a few exceptions. This area is however a bit pricey for Georgia (still however only what you would expect to pay in Wales for a meal or a drink). For homely and even more reasonably-priced Georgian cooking, I would recommend taking a walk up past the Rike park (be prepared to be out of breath, as the hills are challenging even for a valleys boy like me) and Avlabari metro station, to find some restaurants serving carb-tastic khachapuri, with delicious Georgian wine, sides, water and a dessert, for two people for less than £20. 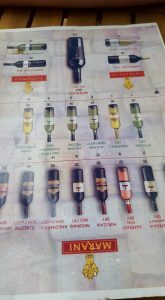 The Georgian wine is something special, with the red wine being the highlight, but the white wines being the novelty, arriving as they are a dark amber colour, due to the uniquely Georgian methods of fermenting grapes, where basically everything goes in to the pot (unsurprisingly, this adds to the strength of Georgian wines). Getting around Tbilisi, and making connections to other parts of the country like Kutaisi, was an easy business, due to the friendliness and approachability of the locals, even the metro staff. When we left Georgia, we did so via an overnight train, and I was at first disappointed that I would be waving goodbye to Tbilisi after dark, missing the dramatic inner city scenery in full glory. However, even at night the scene is a magnificent one, with Mother Georgia on the horizon as we left and headed south standing as a reminder of Georgian hospitality. Holding out her sword in one hand for enemies, and a cup of wine in her other hand to toast visitors, she raised a strange mix of emotions in me: guilt for only being able to spend 3 days in Georgia, and hope and determination to revisit this dramatic, mountainous and ancient country once again in the future.